Pirates, All You Need Cheat Sheet, another one of my famous (infamous?) lists. Well, perhaps not “all” there is to know, but should help you get by. This is a bit of a mish-mash of terms, reference about ships, armament, crew organisation among pirates and things of that nature. 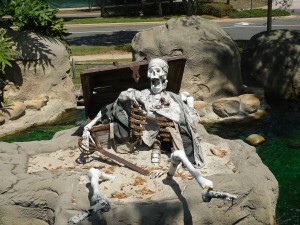 I’ve had occasion to write about pirates several times now (I love them, okay?) and since I hate having to stop writing to look up the name of something, this pirates cheat sheet came in handy. Again, this is meant as a quick reference and can’t replace study of the Golden Age of Piracy, sailing vessels, the Royal British Navy, or the way pirate ships were run back in the day. If you’re going to write about pirates at all, I do suggest studying up if you want to speak with authority. It’s not like how you see it in the movies. My notes were plentiful, though pretty cryptic on this one, since I have most of it in my head. I’ve gone back over my indecipherable short-form and added the explanations that go with the terms, so humans can understand them. I don’t go into much background here on origins or anything unless it was noteworthy for story-development, so this is mostly just the facts, ma’am, no fluff. Incidentally, if you’re looking for a great book on pirates, I suggest Under the Black Flag: The Romance and the Reality of Life Among the Pirates by David Cordingly, the world’s foremost expert on pirates. If you’re only going to read one book about pirates, trust me, read this one. Hope you find this cheat sheet helpful! Captain: Often chosen by the crew itself through vote. The Captain could be removed for being too bloodthirsty or not diligent enough in obtaining riches or generally looking out for the crew’s interests. Most with reputations were respected and feared, some were no more than figureheads who stood above the Quartermaster as a token master. Punishments by death were dispensed by the captain with all crew standing witness. Quartermaster: Captain’s equal in authority. Jobs included distribution of food and riches by prescribed portion, keeping the records and the account books. Additionally, acted as judge settling quarrels and could flog a seaman for minor offences. If another ship was kept in trophy after a raid, the Quartermaster would become Captain of the new ship and take some of the crew with him until he found his own. Boatswain: Officer supervising maintenance of the vessel and the supply stores. Jobs included inspecting the ship, sails and rigging every morning, supervising all deck activities including the deck crew, weighing and dropping anchor, small boats. Boatswain reported directly to the Captain. 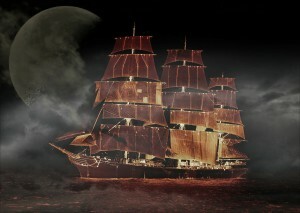 Sailing Master: Officer in charge of navigation of the ship, all maps and courses, could read the stars and cipher well. A difficult position to fill due to the education needed. Most were in short supply and due to the complication of the position, a new Sailing Master was usually captured out of educated navy officers during battle and pressed into service with the pirates under duress. Master Gunner: Officer charged with all munitions, distributing arms for battle, maintenance and care of cannon and supervision of gun crews. Master Carpenter: Responsible for all repairs of any part of the wooden vessel, rails, longboats, masts, etc., under the direction of the Boatswain. Mates: The apprentices to any officers’ positions. Sailor: The general crew without who the ship could never sail. *Note: Officers were not always present on every vessel, smaller vessels required fewer while larger more (obvie). Often several officer jobs were divided and shared between only a couple of men in authority. Only the largest ships had First Mates since a crew of over two hundred would need more supervision. Spanish Galleon: The pirate mother-load. These trade and treasure ships were designed by the Spanish with enormous holds to carry gold. This is a vessel much sought-out by pirates. Features: Large enough to hold a crew upwards of 200, had 2 or 3 decks, 70 cannon, numerous swing guns and archer’s platforms on the 3 or 4 masts. A very heavy vessel with a large turn radius and with a top speed of a modest 8 knots. Man o’ War: Only the main powers of England, Spain and France could afford to use these 3-masted square rig gun ships in any great number. Designed like a galleon, but armoured for war, the largest could weigh 3500 tonnes and have 140 guns. Differences in weight was affected by the number of guns it was outfitted with and was limited by its overall length, factors that ultimately determined its manoeuvrability. Frigate: Moderate-sized man o’ war with lighter armour. Carried 18-40 mid-sized guns on one or two decks and took a crew of 50-200 men to run her. Lighter and faster than a man o’ war, at 300 or more tonnes and over as little as 110 feet in length. The preferred ship of the navy for pirate hunting, because of its speed. Newer frigates, built toward the end of the 1700’s, were reported to hit an occasional top speed of 14 knots (not confirmed). Sloop – Top favourite among pirates and gun runners alike for its speed that allowed them to outrun the navy frigates. Length of its bowsprit was sometimes as long as the rest of the deck. In favourable wind, the jibs (multiple sails attached to the bowsprit) and the square top sail could be hoisted to give her a stop speed exceeding 11 knots. It carried 75 pirates and 14 cannon. 3-masted square-rigger – Fitted with 20 cannon, larger than a sloop, it carried a crew of 200. Comparable in speed to a navy frigate, it had twice the cargo space of a sloop. A substantial vessel, it was like the less-elaborate, smaller twin of a Spanish galleon, capable of speed enough to outrun the navy, hold lots of booty, and sturdy enough to make ocean crossings that opened up a world of plunder possibilities. Forecastles and aftercastles were strategic for protection during a boarding–it was preferred to allow the enemy to try and board in the centre and fight them off from the high castles at either end of the ship where the crew remained in safety. Cutlass – Preferred weapon of Caribbean pirates in the 17th and 18th century. About 2 ft long, a straight or slightly curved blade with a single edge. Strong enough to hack through heavy rope, bodies, sail canvas, etc. Excellent weapon in close quarter hand fighting aboard ship. Boarding Pike – Long spear with a wooden handle and metal tip. A common weapon, shorter than a regular pike, about 6 lbs and 4-6 ft long. Could be thrown or held. Due to length, effective against swords and knives during a boarding. Many pikes were usually kept on racks around the base of a mast. Boarding Axe – Used about as often as a cutlass, popular hand weapon for fighting fires and boarding parties equally. Useful for climbing the high wooden sides of ships (like an ice axe for mountain climbing). Also useful for cutting rigging lines to bring down sails. About 4 lbs and 2-3 ft long. 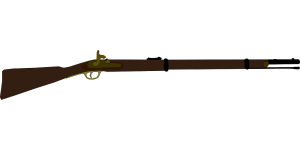 Smooth bore Flintlock Musket – More reliable in wet ship conditions than earlier matchlock firing mechanism models. A long range sniper weapon preferred for picking off boarding parties before they reached the deck. More accurate than earlier models (became the model for the modern rifle). About useless at close range during raids. Queen Anne Flintlock Pistols – Hand-held weapons in use about 1720-1780, during the Golden Age of Piracy. Packs a punch, but only fires one shot of lead ball and takes a long time to reload. Blunderbuss – A close range weapon. Some fired large ball shot, but usually loaded with a handful of pistol balls and any other loose paraphernalia such as glass, nails, or any other junk. A single blast could take out several bodies at once and create havoc on a crowded deck. Weighed between 10-16 lbs and was 2-3 ft long. The flared muzzle was meant to give it a wider spray. Deadly, but unreliable, as the powder to fire it often became damp. Dagger – Short bladed weapon, every sailor including pirates carried one due to usefulness from work to raids to cutting food. Small, between 1-2 lbs and between 12-18 inches long and could be hidden under clothing. A close quarter fighting weapon. Dirk – A short dagger, various lengths less than 12 inches. Designed for throwing and useful in cramped fighting conditions. Rapier – Not popular among pirates by the end of the 17th century. Long, thin, straight-bladed sword, sometimes still favoured by educated “gentlemen”, could be easily broken by a heavier blade. A variety of lengths and detail depending on the country of origin. Used primarily for duelling, crap in close quarter combat or as a boarding weapon and carried by high-ranking naval officers. About 2 lbs. Small / Short Sword – Straight-bladed hand weapon, designed for thrusting. About 2 lbs and 30-40 inches. Could become broken by a heavier sword, mainly used for duelling. 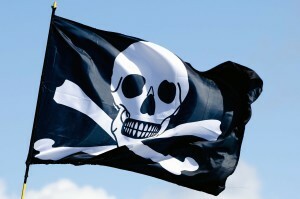 Bows and Arrows – (and crossbows) Centuries old weapons still in use on pirate ships. Used from archer platforms attached to the masts, useful for picking off fleeing enemies during a fight. Difficult to maintain accuracy, however, on a moving vessel or in wind – accuracy and range varied according to the skill of the archer. Grenade – Also called powder flasks, were in common use by 1700. A small, hollow ceramic ball fitted with a fuse, could also be made of iron, glass or wood. Filled with gunpowder and small pieces of metal to cause damage or stuffed with rags to create fires upon impact. Unreliable burn rate, climate and weather greatly affected good use, presented a serious danger to the person throwing it as they could go off early. Cannon – Made of cast-iron during the 1700’s (replacing previous bronze cannons), took a crew of 3-4 men to operate (fire/reload). Reloading took a couple of minutes and required much practice. Ship would turn broadsides to an enemy vessel and cannon would be fired repeatedly during battle. Could fire a variety of shot. Referred to by the type of shot fired, each cannon weighing roughly 200 times the weight of the shot (ie: a “10 lb cannon” fired 10 lb shot while the cannon itself weighed about 2000 lbs). Sizes varied from 2 pounders to ship-destroying 24 pounders. Pirate sloops or schooners typically carried 4-8 pounders. Maximum effective range 100-200 yards. Inaccurate, wore out quickly, becoming unsafe after 500-1000 shots fired. Grape Shot – Small ball shot packed into bags. Bag burned when the powder ignited, releasing a spray of 3/4 inch balls in a wide pattern. Often used to repel boarders. Canister Shot – Same idea as grapeshot – gravel, nails, or musket balls were packed into a metal container. The container exploded when fired, releasing a spray of shrapnel. More accurate than grapeshot at closer ranges. Became more popular than grape shot as time went on. Sangrenel – Another type of anti-personnel shot – a bag filled with jagged pieces of scrap iron. Only effective at close range. Bar and Chain Shot – Two cannon balls or two halves of one cannon ball held together by a bar or a chain. 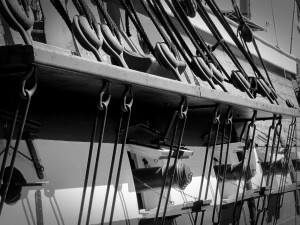 Specifically used for tearing up rigging and sails and especially for splintering a ship’s masts. The shot would twine itself around a mast and could break it. Not effective against a ship hull, had a shorter range than a standard cannon ball. Bundle Shot – Iron bars tied together with rope. When fired, the bars would spread out, twist and turn, and could inflict severe damage on a crowd. Extremely effective at close range. 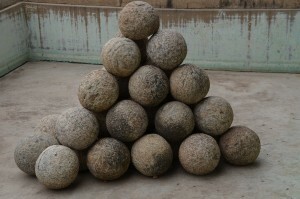 Round Shot – Regular iron cannon balls. Made it common sizes (to fit the sizes of cannon), but no two were ever exactly alike due to method of manufacture. Not accurate at long distances, but could travel further than other types of shot. Could also be used against shore fortifications (take down fort walls). Hot Iron Shot – Heated to red hot just before firing, used to set enemy ships on fire. Dangerous to the gun crew, as the heat could ignite the powder too soon and explode before becoming airborne. Explosive Shells – Hollow cannon ball fitted with a fuse, needed to be lit directly before firing. Meant to explode upon reaching the enemy’s ship causing maximum damage. Also extremely dangerous to the gun crew, as it could blow up prior to firing. Next Post Should new writers pay reading or submission fees?